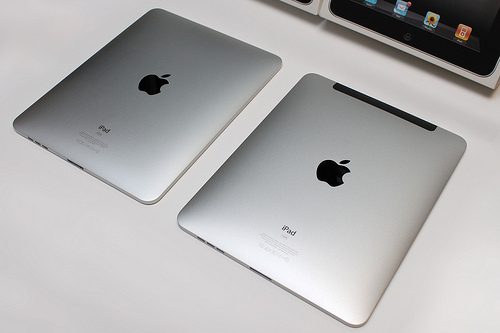 According to Digitimes’ senior analyst Mingchi Kuo, Apple will be launching two upgraded iPad devices in the first quarter of 2011. The first tablet will be an upgraded 9.7 inch iPad with a new ARM Cortex-A9-based processor and 512MB RAM with a second 7-inch iPad featuring a Cortex-A9 processor and an IPS panel with a resolution of 1024×768. In addition to an iPad update, Apple is also expected to start mass production on a CDMA iPhone in December, supplying Verizon Wireless and China Telecom with a handset that features an integrated antenna. The new Apple TV wasn’t left out by Digitimes either, this new device will be powered by an AMD Fusion chip and will not ship with a hard drive. It will, however, adopt a similar interface to the iPhone’s iOS, with support for social networking, multimedia and also an App Store. Construction of the Apple TV is also expected to begin in December. The report adds further credibility to recent reports of a CDMA iPhone and an iOS powered Apple TV, Verizon is expected to officially announce the iPhone at CES 2011. As for the iPad, that remains to be seen, Apple are renowned for their one year development cycle so its a distinct possibility. As always, we will let you know as soon as any of the above products are confirmed.